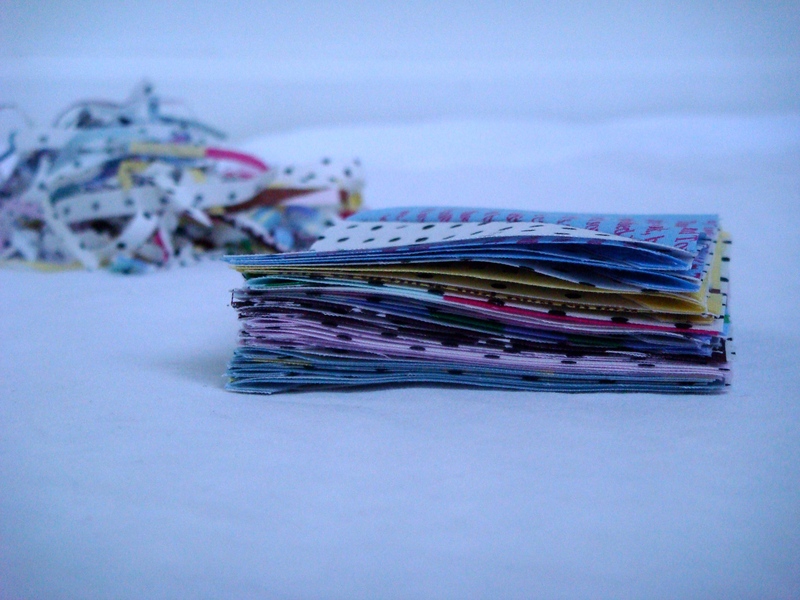 I’ve been thinking recently about why quilting is so enjoyable and satisfying to me. It’s definitely because after all the hard work I’ve created something beautiful and useful. But it’s also definitely because of the beauty of the process. 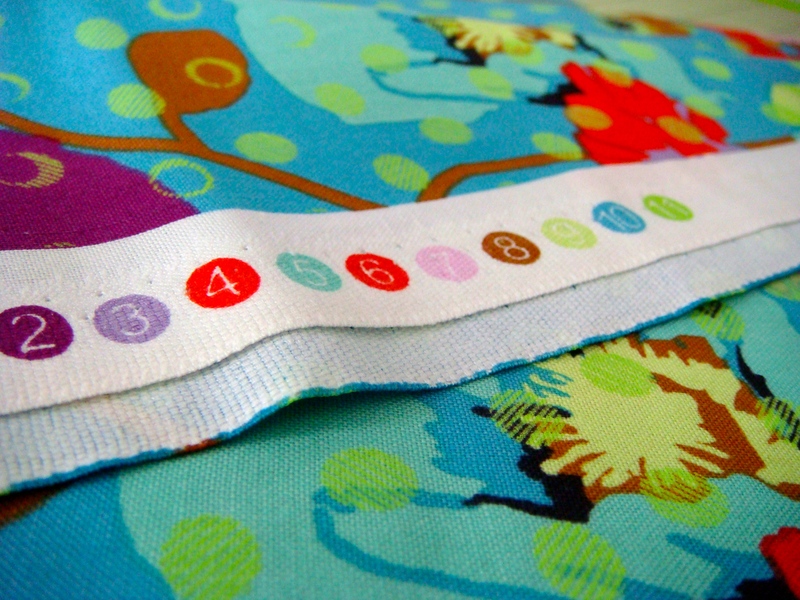 I love fresh, uncut fabric. 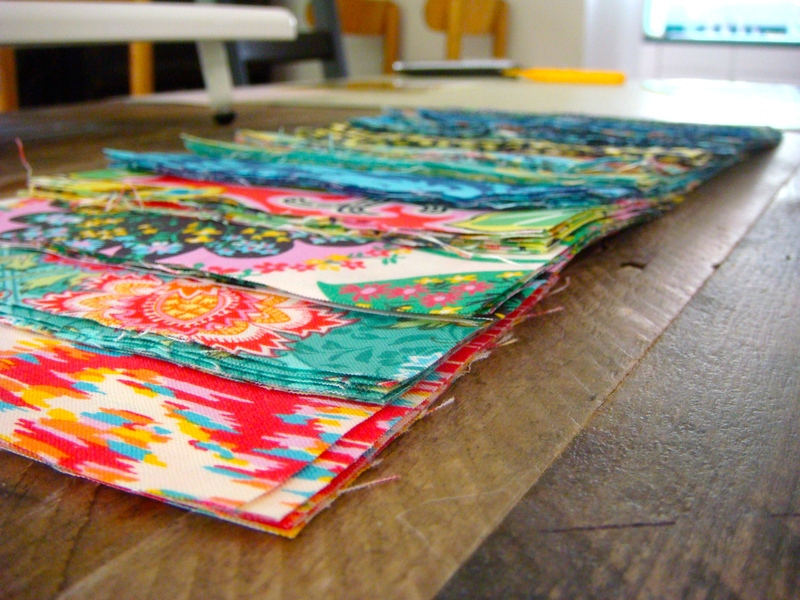 I also love cut fabric. 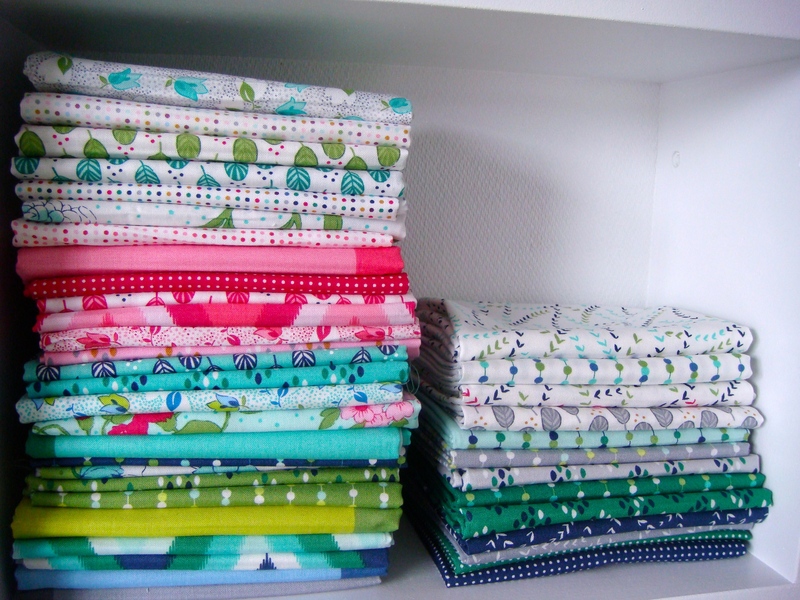 I’ve come to believe that fully half of my enjoyment of quilting is being surrounded by pretty things. 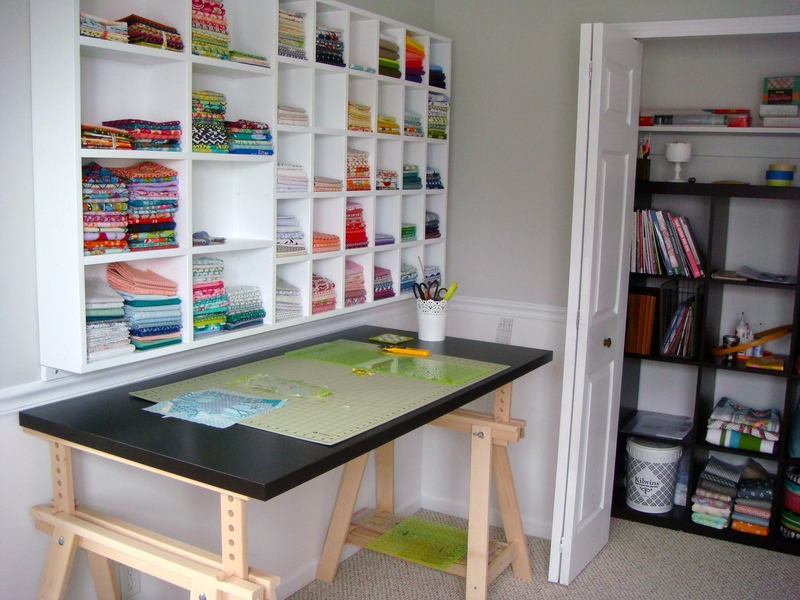 So when we recently decided to bunk Mr. 2 and Mr. 4 together in the same room (which they are loving by the way), I took care to make my new sewing room a beautiful place to spend time. Lots and lots of time. 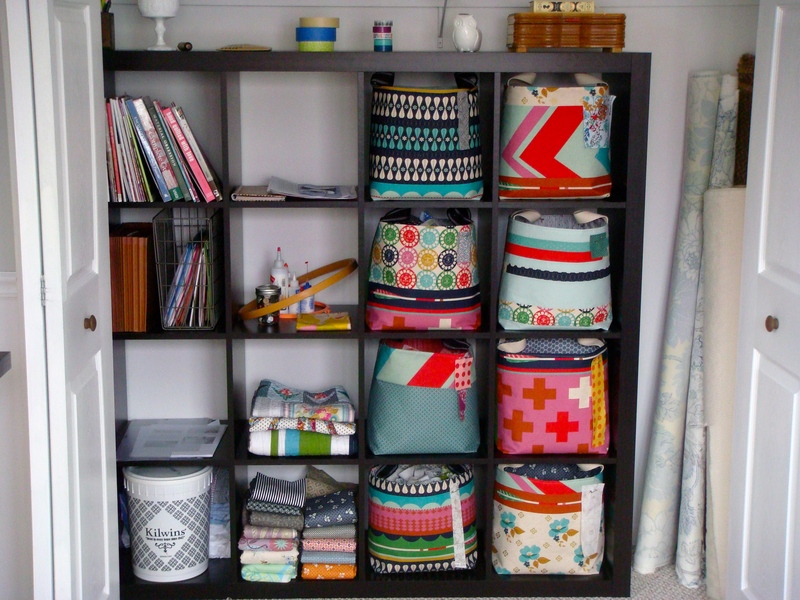 Of course priority number 1 was effective fabric storage. 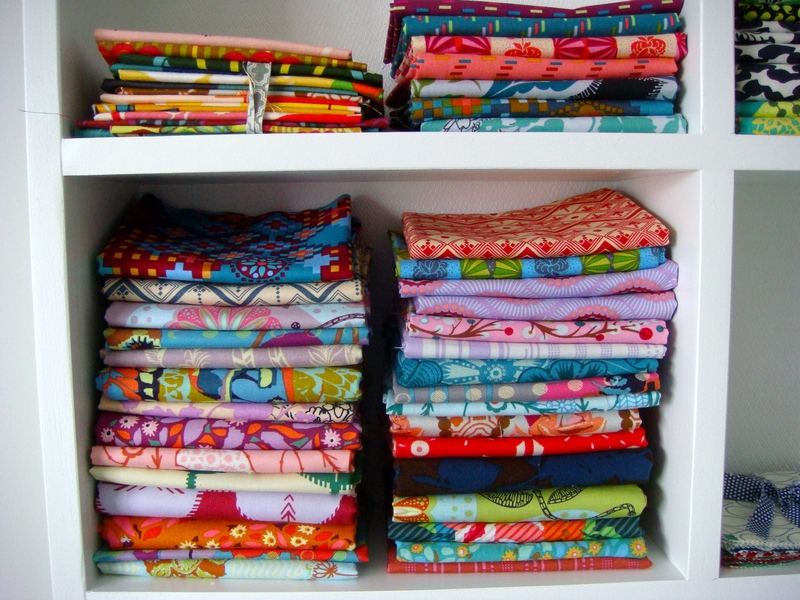 I have been folding my fabric Jeni Baker style for a while now. I love how it looks, but the stacks can be a little tippy. 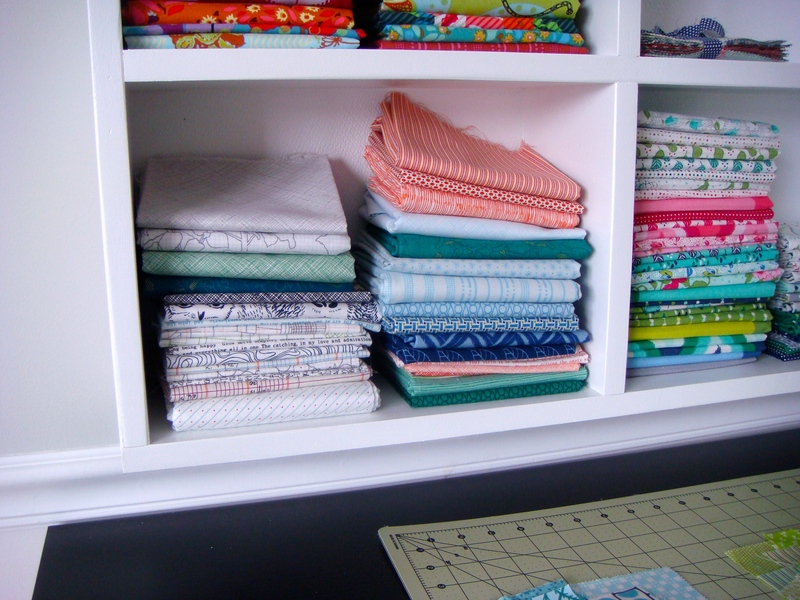 I saw some shallow craft shelves on another blog and it occurred to me that a little back support is exactly what these stacks need. I enlisted the services of a talented local carpenter and could not be happier with how it turned out. On the left I wanted some larger cubbies for collections. Pretty, inseparable collections. Part of me resists storing them this way because I know it discourages integrating the different lines together, which is something I personally strive to do. But seriously. I can’t help it. Too pretty. And anyway, how would I begin to sort my AMH by color? 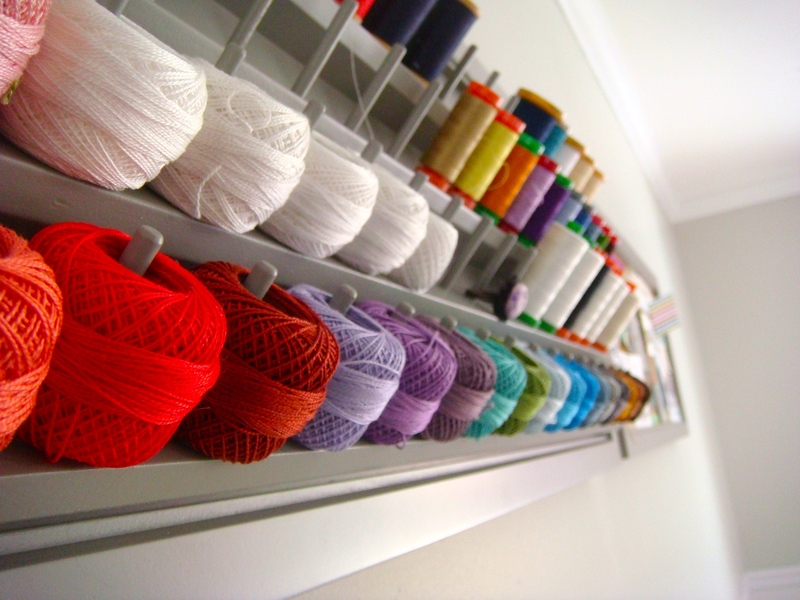 Who else has selvedges with 15 colors? Well, ok, Amy Butler gets a shelf too. I also designated a shelf for the project I’m working on at the time. Right now that’s barn door. The rest of the shelves are organized loosely by color. 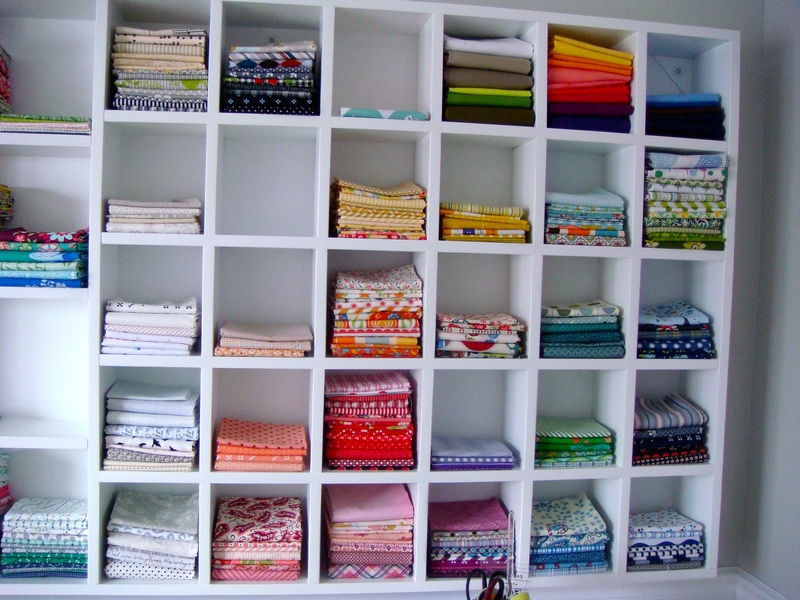 I’ve promised my husband that when the shelf is full I’ll stop buying fabric. At least until I use enough to make more room! Even if I’m the only one who’s really going to see it on a daily basis, I think it’s worth it to keep my stash as beautifully organized as possible. 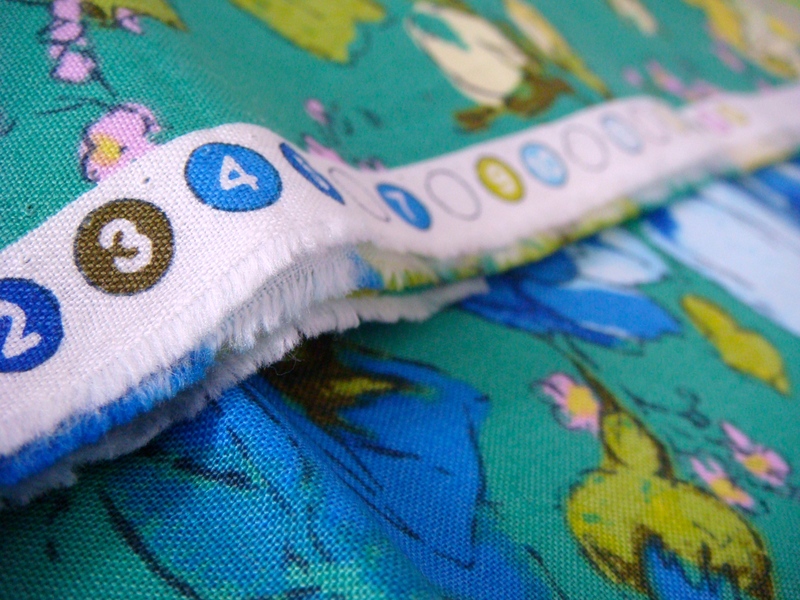 Maybe this is one of the keys to actually wanting to use the fabric I already have instead of always feeling like I want to buy more. We made a special trip to the nearest Ikea for the counter-height cutting table with handy shelves for scrap sorting and ruler storage. 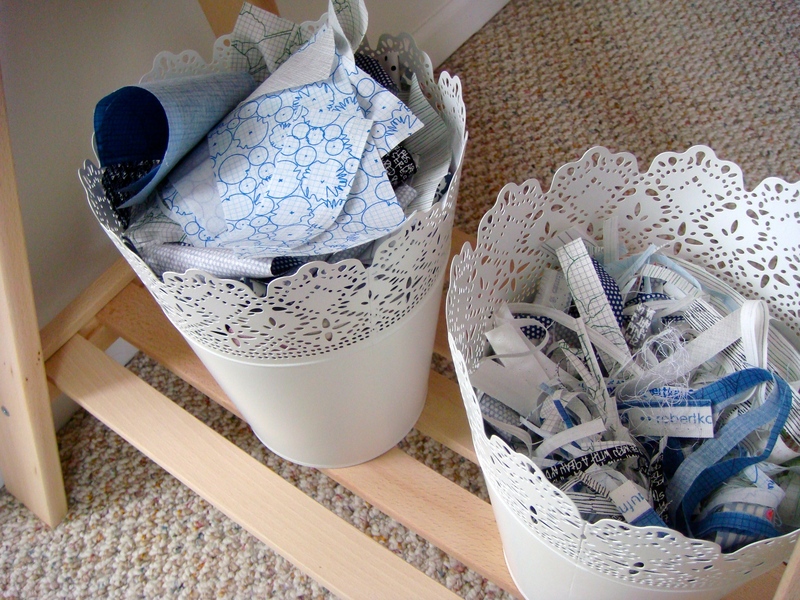 I have one scrap bin for usable scraps to keep and one for unusable scraps to also keep – in case I need to stuff something or make an art quilt. 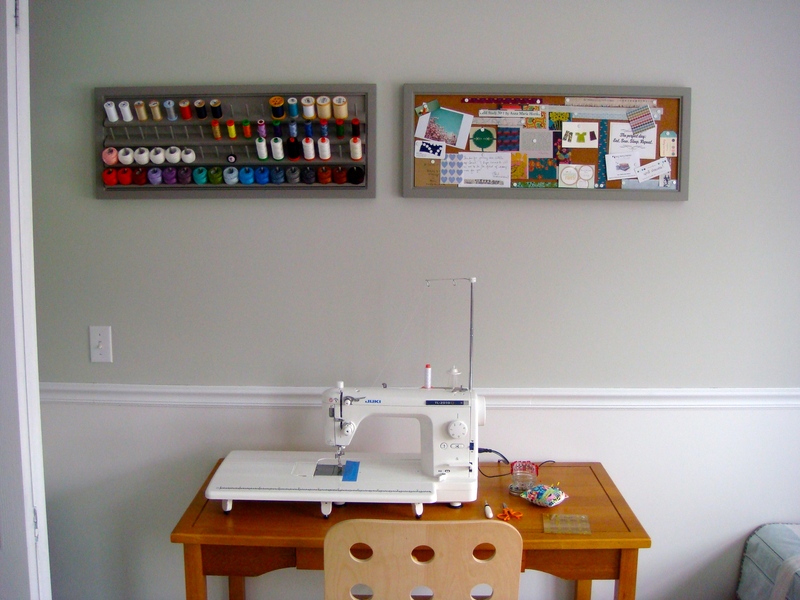 And here’s my thread organizer and matching cork board for inspirational notes, fabric bits, and pictures. And my Juki! You can read about my love for my Juki here. 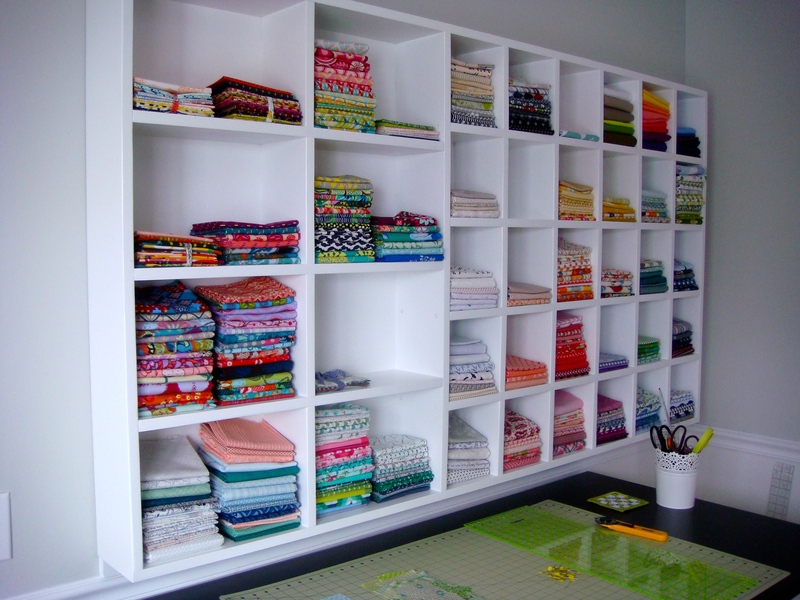 I think my 2nd most favorite element in my new sewing room is my scrap organization system. But!! I want to share that with you in a slightly different way. 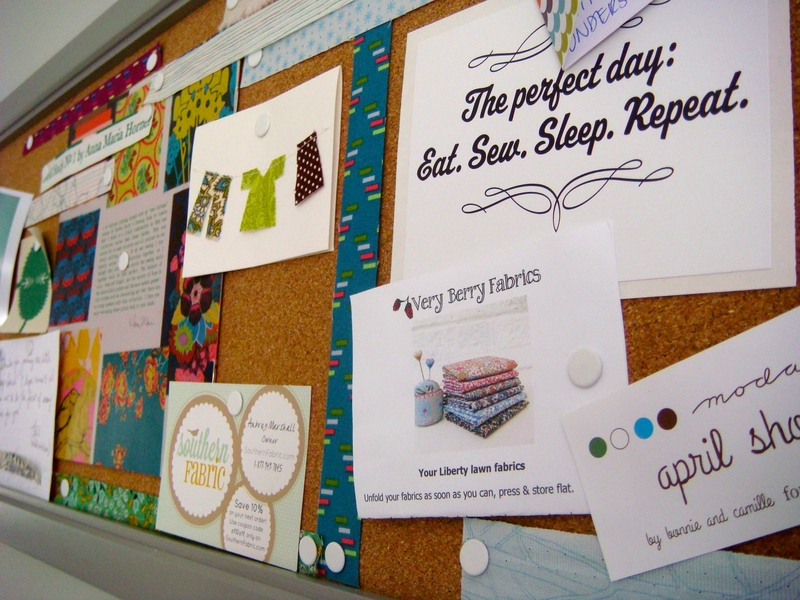 I’m guest hosting as part of Sarah’s Scraps 101 series @ mila+cautro today! You really must click over and visit me there! 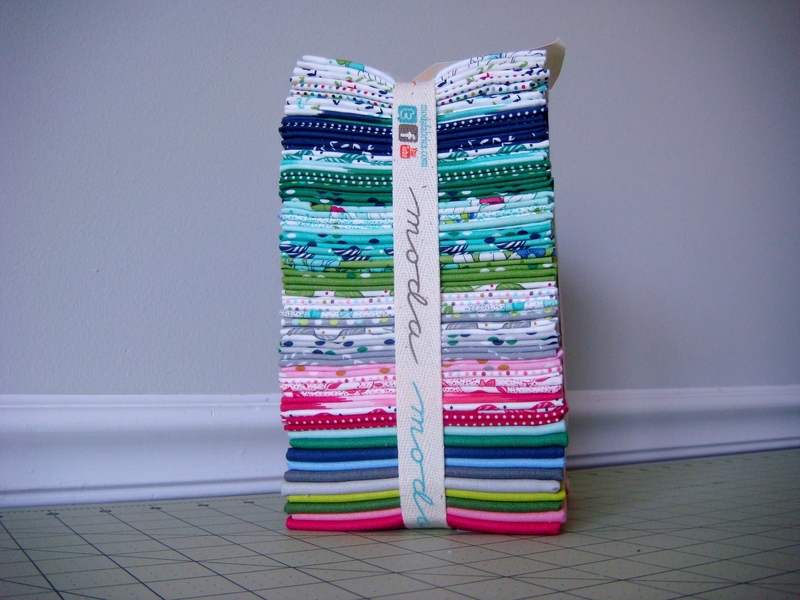 Of course I’ll be back Monday for week 2 of the barn door quilt-a-long. I am so excited to show you my progress and see yours! I have been posting regularly to Instagram. 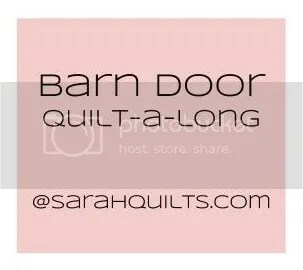 I’m @sarahschraw and we’re using #barndoorqal. I also added a little Instagram widget to my sidebar for anyone who’d rather check in here. 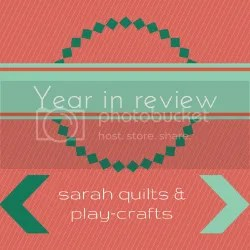 Lastly, the Year in Review party is closing in just a couple of hours! I am about half through visiting all the links and it has been such fun to see what everyone did last year. I plan to visit the last half as soon as the party closes so I don’t miss anything. 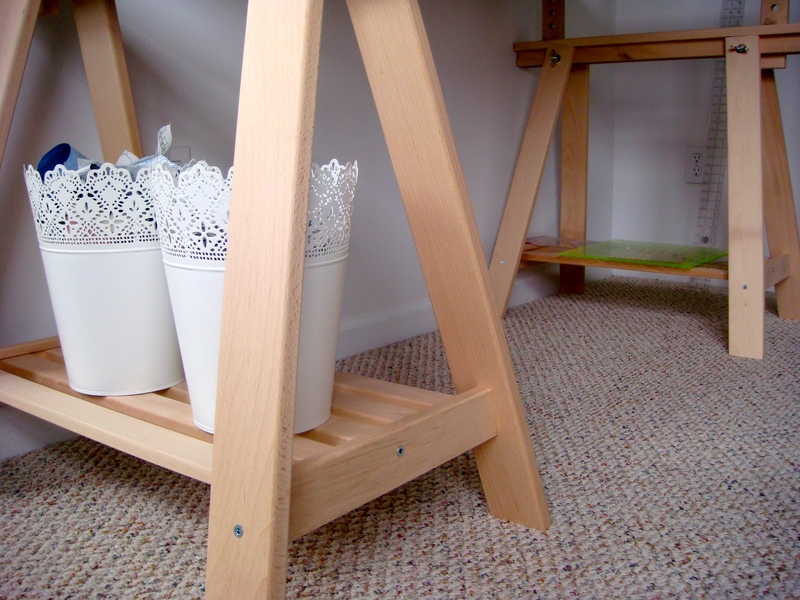 I’m linking up with Crazy Mom to celebrate the completion of my sewing room and my 8 scrap baskets! Don’t forget to visit me here to hear much more about those. 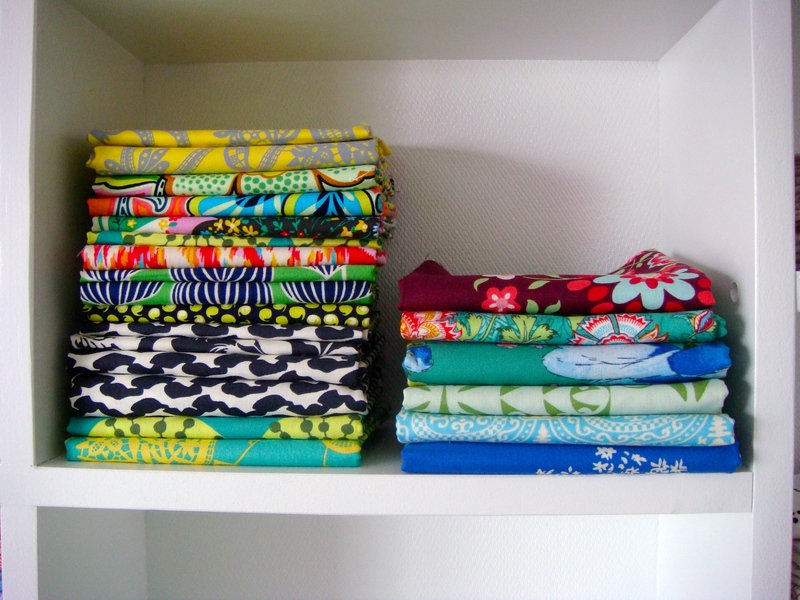 And I think all these pretty fabric pictures entitle me to link up for Sunday Stash as well! 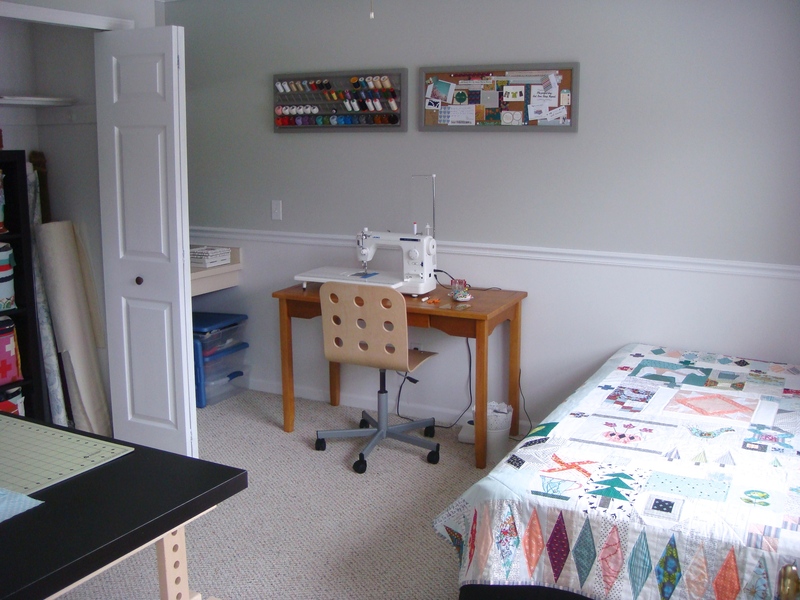 This entry was posted in Uncategorized and tagged fabric shelf, folding fabric, Jeni Baker folding, Sewing room. Bookmark the permalink. Thank you, I’ve recently been looking for information approximately this topic for a long time and yours is the best I’ve came upon so far.